Educators and students are invited to join Music Director & Conductor Stephen Alltop and CUSO for an interactive, educational concert in the Foellinger Great Hall at the Krannert Center. Each concert is approximately 45 minutes. Wednesday, April 17, 2019 • 9:30 a.m. & 11:15 a.m.
Thursday, April 18, 2019 • 9:30 a.m. & 11:15 a.m.
From fish to fossils, donkeys to kangaroos, The Carnival of the Animals by Camille Saint-Saëns turns the orchestra into a marvelous zoo! Enjoy this humorous musical suite and the fun ways these many creatures come to life in orchestral instruments. Teachers who would like to register for the April 2019 Youth Concerts can get more details by downloading the poster. The CUSO Youth Concerts provide elementary school students in Champaign County a live symphonic musical experience in the Foellinger Great Hall of the Krannert Center for the Performing Arts. More than 3,000 area students attend these concerts every year, and the popular concert series draws students from a 50-mile radius. Participating teachers also receive an Educator’s Guide and recordings for pre-concert study in the classroom to help enhance their students’ concert experience and musical education. The Champaign-Urbana Symphony Orchestra first performed the Youth Concerts (known then as Young People’s Concerts and KinderKonzerts) in 1964. 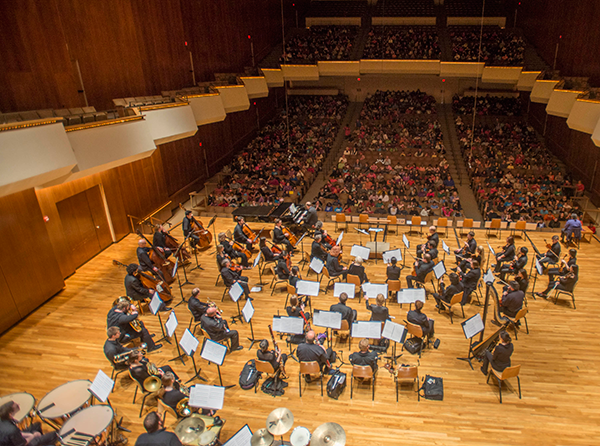 Early on, the concerts were in Foellinger Auditorium, but their popularity necessitated a move first to the Assembly Hall and then to the Krannert Center for the Performing Arts, where the performances have been held since 1975. The CUSO recognizes the importance of engaging future generations with classical music. The Youth Concerts are a critical part of the CUSO’s mission and an opportunity we are proud to provide. The CUSO Youth Concerts are produced by the Champaign-Urbana Symphony Orchestra, the University of Illinois School of Music Office of Public Engagement, and the Guild of the Champaign-Urbana Symphony Orchestra. The concerts are made possible with major sponsorship support from PNC Bank. Additional support is provided by The Robeson Family Benefit Fund, Champaign West Rotary, the City of Urbana Public Arts Commission, and the Illinois Arts Council Agency.